As I sit here in my hotel room, on the morning of the last performance of “Blessing the Boats: The Remix,” I can’t help to think back on this experience, and how much it has moved me to be a part of it. It was 18 months ago when I got a call about being in a the three-man ensemble that, with the guidance and leadership of Rhodessa Jones, was to remount this seminal work by the late poet-performer and educator Sekou Sundiata. Thus began weeks of rehearsals, collaborations exploring how to best bring forth this man’s work. One thing that moved me from the beginning of the process, was that the script was perfect, poetically and dramatically it was all there-with a language that was SO rich and vibrant. For real, our job was to tell the story and not get in the way, no need to push or force an emotion, Sundiata’s text gives you everything you need as the performer. From rehearsals we presented a two show reading of the work at the Apollo last June, this was followed by 4 nights of performances at the River to River Festival, and most recently, a two week run at the Public Theatre (as part of the Under the Radar Festival) and a week run out here in Costa Mesa California. Wow, at The Public there were sold out shows, rave reviews, and emotionally stirred audiences, many of who knew Sekou-there were some extremely vibrant moments during the Public shows. Now here in Costa Mesa, the audiences have been smaller, and not as aware of who Sekou Sundiata was, still the responses have been overwhelming. Folks have been feeling the work out here, and wanting to find out more about Sekou and his legacy. 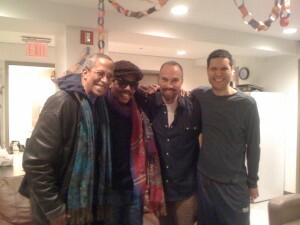 Along the way, I have bonded deeply with my fellow performers Carl Hancock Rux and Mike Ladd. We’ve known one another for a long while now, but with each one of us having our own canon of work, we’ve never had the chance to collaborate. It’s been inspiring, and back stage can at times be hilarious-those brothers are funny and never without a sense of humor about things. I’m going to miss them as we go back into our own works and disperse after tonight’s final performance. Though there is some talk of a national and international tour next year-who knows? Maybe there’s some more work to do as Blessing the Boats travels to a your city, maybe the adventure is not concluding tonight, but just getting started. This entry was posted in BLESSING THE BOATS: THE REMIX, NEWS, PHOTOS and tagged Blessing the Boats, BLESSING THE BOATS: THE REMIX, Carl Hancock Rux, MAPP, Mike Ladd, New York Theatre, Reg Cathey, Rhodessa Jones, Roger Guenveur Smith, Sekou Sundiata, The Public Theatre, Theater, Under the Radar Festival, Will Power. Bookmark the permalink. Trackbacks are closed, but you can post a comment.